Happy Thanksgiving and holiday feasting season! I was on the mainland this fall and got to enjoy a few weeks of cozy sweater weather and cooked meals with my favorite autumn ingredients. I baked a lot. 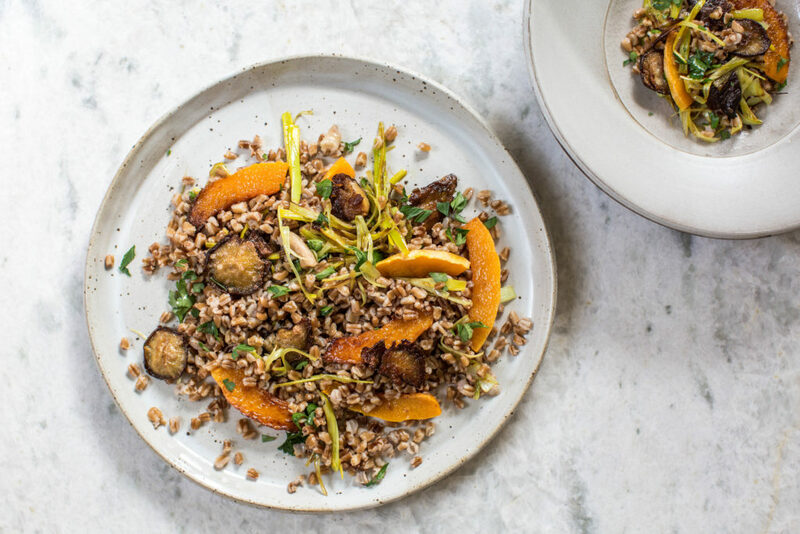 Tested new recipes, including this warm farro salad, and caught up on a few books and shows (I’m all about the Durrell’s in Corfu right now). After two years skipping winter for island weather, I forgot how much I missed the seasons and the sweet little traditions that come with it. My overheated pitta was happy for a rest and reprieve after a hot summer and late heat wave in Portugal last month during our retreat. With fall fare in mind, I also rounded up a series of holiday-focused plant-based recipes to carry on my annual Thanksgiving Guide tradition. 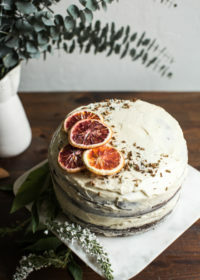 So as you’re crafting your Thanksgiving menu this week, here are some fun ways to bring more plants into your celebrations. Be sure to check out my past Thanksgiving Guides for more menu ideas – 2013, 2014, 2015, 2016, 2017. 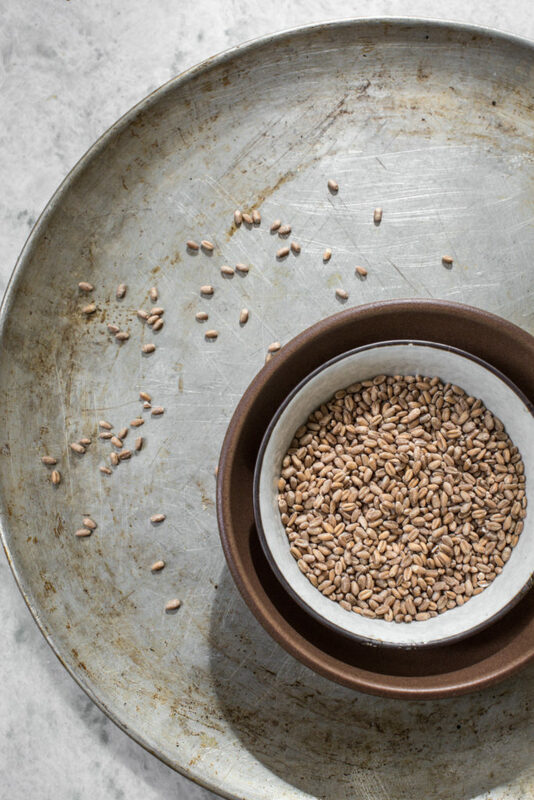 Farro is a term that refers three specific wheat species: spelt (triticum spelta), emmer (triticum dicoccum), and einkorn (triticum monococcum), which are all types of hulled wheat. Some supermarkets label them by their Italian names: farro piccolo (einkorn), farro medio (emmer), and farro grande (spelt). 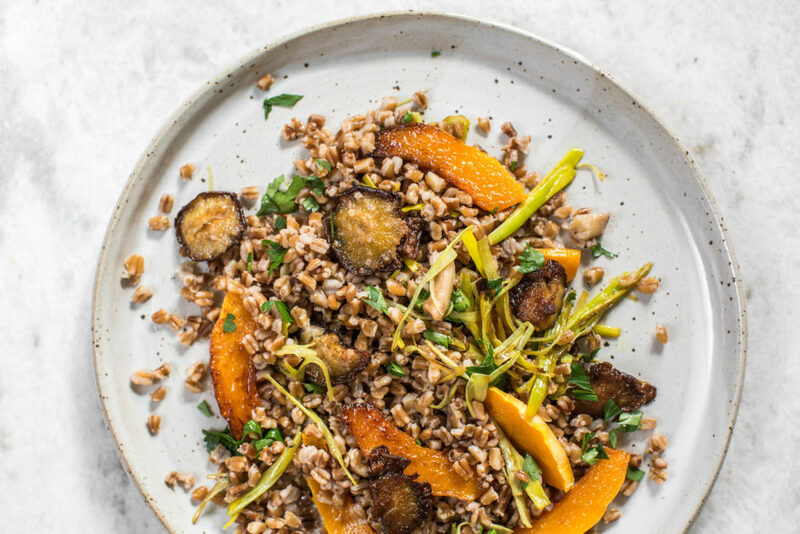 To add even more confusion there is whole grain farro, which has highest concentration of fiber and nutrients (like vitamin B3 and zinc) but requires longer cooking times or overnight soaking. Semi-pearled farro has part of the bran removed but still contains some fiber; and pearled, which takes the least time to cook, has no bran at all. For this recipe, I used the whole grain farro (farro medio/emmer) and soaked it overnight before I went to bed. The next day, I drained and rinsed it, the spread it across a baking sheet and toasted it in the oven at 450F for 10 minutes to give a richer toasted flavor. 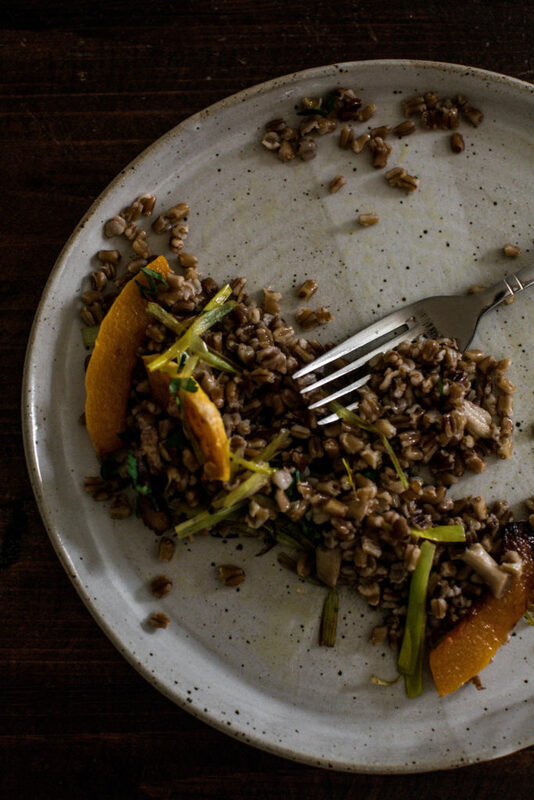 This step is completely optional, simply soaked farro works just fine, but it gives it more of a rich, toasted flavor. To cook, I used what Bon Appétit calls “The Pasta Method”, which is essentially bringing a well-salted pot of water to a boil like you would to cook dry pasta. Per their recommendation, I added aromatics to my pot of water for extra flavor, using the trimmings from my leeks, the stems of the shiitakes and two sprigs of fresh tarragon to the water. I brought it to a rapid boil and then added the toasted dry farro into the water. I kept in on a boil for about 30-35 minutes until it was cooked but still al dente. When I strained the farro, I removed the herbs and leeks, but left the stems of the shiitakes because they were tender and delicious in the mix. I’ll admit, this warm salad isn’t necessarily the quickest recipe. In fact, despite having a shorter ingredient list, it’s a more bit laborious than most with its many cooking steps. But I promise it’s well worth the effort for these complex flavors and textures. It’s also satisfying on its own, but pairs with as a side with other protein dishes (ie. turkey for your more traditional Thanksgiving or Christmas feast). 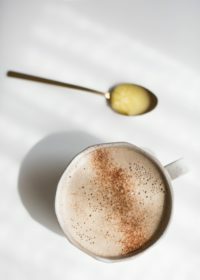 And the warming foods and sweeter flavors make this a grounding, nourishing dish for autumn and early-winter’s vata qualities. Soak the farro for 1-2 hours. Drain and rinse, then pat dry on a towel. Then spread the farro across a baking sheet. Preheat the oven to 400F. 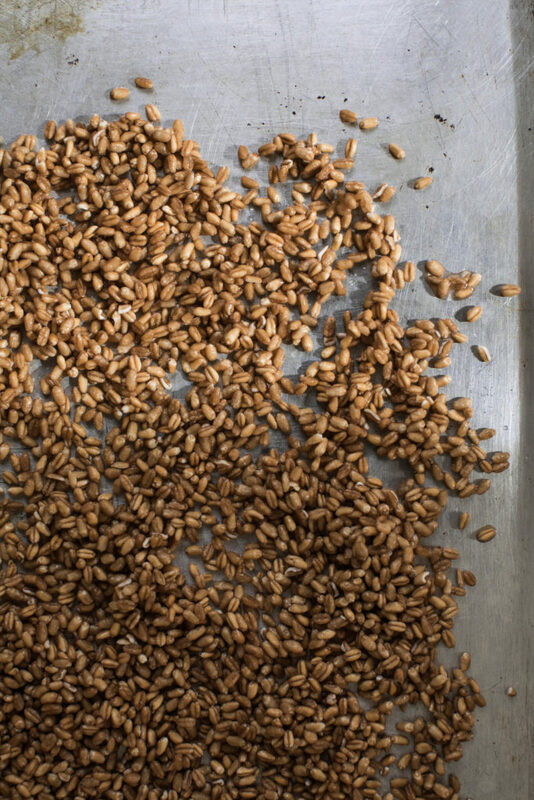 Place the baking sheet in the oven to toast the farro for 10 minutes. Shake the pan one to two times to prevent burning. Remove and allow to cool for a few minutes. Leave the oven on. 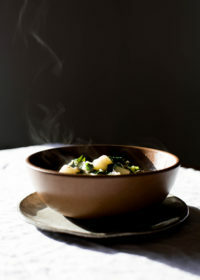 While the farro is in the oven, bring a well-salted pot of water to a boil in a medium pot. Add a few of the outer leaf trimmings from the leek and a few sprigs of fresh herbs to the pot. Remove the shiitake stems and add them to the pot. Bring to a boil for 5 minutes. Add the toasted farro to the seasoned boiling water and cook for 30-35 minutes, or until al dente. Once done, pour into a colander to drain the water out. Remove the leek pieces and herb stems from the mixture, leave the shiitake stems, which are well-cooked and soft now. Once the farro is cooking in the pot, toss the butternut squash in olive oil and spread across a baking sheet. Sprinkle with salt. Place in the already heated oven at 400F for 20 minutes or until tender and golden. Remove from oven and set aside. On another baking sheet, spread the shiitake mushrooms coated in olive oil and sprinkled with salt. Place in the oven to roast with the squash. Both should finish around the same time, but keep an eye out on both while in the oven. Remove from oven when done and set aside. Lastly, heat a skillet with olive oil and add the finely sliced leeks. I peeled the outer layers of the leek, cut them into 2-inch pieces, quartered them and then sliced them finely lengthwise. Sautée the leeks in the olive oil on a medium heat for 2-3 minutes. Add the golden raisins. Sprinkle the coconut sugar over top and reduce to low heat. Continue to caramelize the leeks with the raisins for another 5-7 minutes. Stir frequently to avoid burning. Remove from heat when done. Squeeze a bit of lemon juice over top. 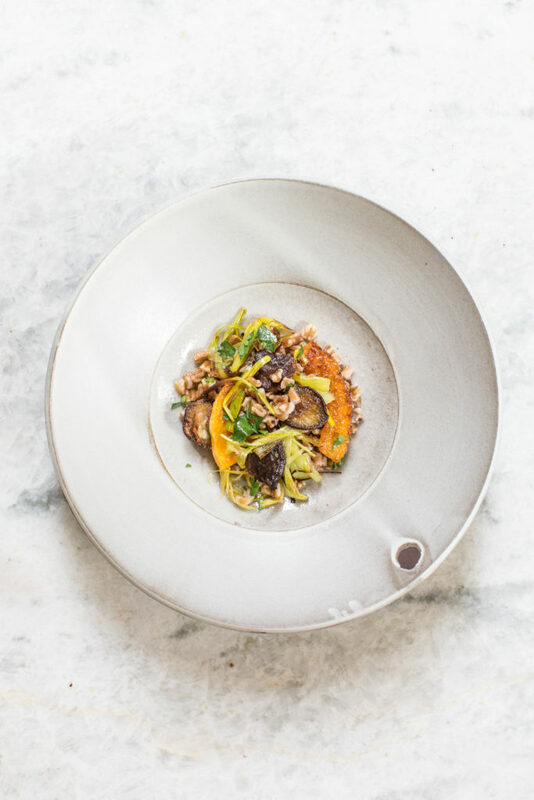 To assemble, combine the cooked farro, sautéed leeks and raisins, roasted butternut, shiitakes, and chopped parsley. Sprinkle sea salt, fresh cracked pepper and squeeze some lemon juice on top. 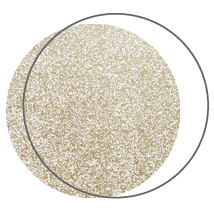 Toss lightly to combine. Taste and adjust seasonings as needed. Serve warm.